All CYCE members and nonmembers interested in CYCE are welcome to join the board in discussion routine and new business. We meet on the second Wednesday of each month except July and August. We meet in the Board of Commissioner's Room at the Port of Edmonds. The street address is 336 Admiral Way, Edmonds, WA 98020. The room is on the second floor above the bathrooms. The CYCE Frostbite Series is every other Sunday from February 17 to April 28. Please use and monitor Channel 72 for races. Check in with the committee boat in person before each race, or check in via radio if you are still on your way to the start area within 15 minutes of the first start. A printable race schedule with committee boat assignments is here. The race instructions and other information are here. The CYCE Summer Series is every Wednesday from May 8 to August 15, with one week off around Independence Day. First start is at 6:30 pm. The summer series also includes a cruising division, which starts first. The Quarterdeck looks forward to seeing you at the spring potluck at the Maplewood Rock and Gem Club, located at 8802 196th Street. SW in Edmonds. The date has been changed to Friday May 10. The doors will open at 6 PM for a social hour and the buffet line will start at 7 PM. Appetizers if your last name starts with A-H.
Main or side dish if your last name starts with I-P.
Dessert if your last name starts with Q-Z. The Club will provide place settings. Please bring your own beverages. We are having a silent auction again. The items are displayed and signup sheets are attached with a minimum bid amount suggested. All the buyer has to do is sign his or her name and the amount of money bid. There is a time limit on the auction and the last and highest bid at closing of the bids takes the item home. Members are invited to contribute items they think might be desirable to other members and their guests. The items need not be nautical. In addition, last year's auction team is securing donations from businesses in Edmonds and beyond. Anyone is welcome to join in on this effort. This year, we're adding a raffle table, so no donation is too small! We can collect any or all of the contributions up to the start of the potluck. You can also bring items to the dinner yourselves. We will need to know what you are bringing so we can prepare the necessary paperwork for the items' bid sheets, so please email us at cyceofedmonds@gmail.com with what you're bringing. Last year we made nearly $1000 at our auction, which provided some nice padding in our bank account! Vice Commodore John Bennett is coordinating the work party this year. Larry Hoppe has offered Sinelele for our ferry across and back, so we'll be very comfortable both ways. Details are forthcoming about start and end times and the nature of the work. We provide grilling supplies and a modicum of libation to Port Madison Yacht Club for our Memorial Day Cruise and party, May 25, 26 and 27. Traditionally, Saturday evening is an appetizer potluck. Sunday, please bring something to grill for yourselves plus a salad or dessert potluck item. The grill will be fired up sometime after 5 pm. Please send questions and RSVPs to cycofedmonds@gmail.com. All sailors are welcome. 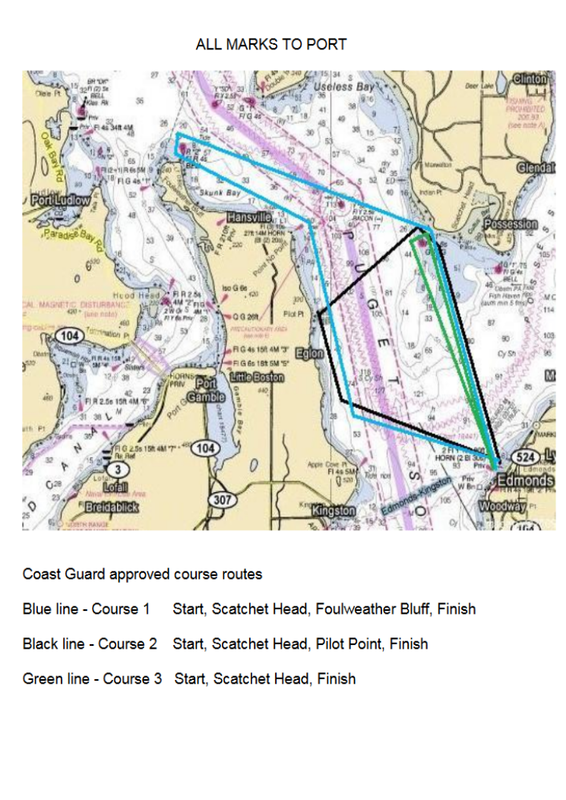 Join CYCE in a weekend single-hand/double handed pursuit race from Edmonds to Port Ludlow on Saturday, and race back to Edmonds on Sunday. Children and guests not handling sails are allowed (see race instructions). Socializing and pot luck barbeque and first day awards ceremony on Saturday afternoon and evening. CYCE will provide hamburgers and all guests please bring a side dish or appetizer to share. Important: All skippers are responsible for making their own moorage reservation with Port Ludlow Marina. Call 360-437-0513 or use their online system at https://portludlowresort.com/request-a-slip/. The Notice of Race and Sailing Instructions are here. The Halloween Series is on (almost) every other Sunday from August 18th through October 27th, with the first start at noon. Annually CYCE and Milltown Sailing Association face off in a friendly duel with as many boats from each club as possible to win the prestigious banner. We alternate between Everett (homeport of Milltown Sailing Association) and our homeport of Edmonds. This year, the race is in Edmonds. Join us to get the banner back from Milltown! Skipper's meeting at 2 pm. Start: The start sequence will begin at 2:55 pm. Class 1 (Flying Sails) will start at 3:00 pm and Class 2 (Non-Flying Sails) will start at 3:05 pm. A courtesy sound of 5 short horn may be sounded one minute prior to the first start sequence. Post-Race Social: All competitors (skippers, crew, and friends) are invited to attend the post-race dinner and social following the race at a location to be determined. Skipper's meeting starts at 8:00 AM at Anthony's Beach Cafe. The first division will start at 10:00 AM, reverse starting sequence, with multi-hulls in the last start. Yachts with a PHRF rating of 180 and lower will race the 26 mile feature course, weather allowing. Yachts with a PHRF rating of 181 and greater and NFS division will race the 18 mile course weather allowing. Scoring is Time on Time. Trophies include 1st, 2nd and 3rd place in each division, and the perpetual Bill Heston Performance trophy is awarded to the first place overall monohull winner. This race is also a team event. The Grand Perpetual Foulweather Bluff team trophy is awarded to the yacht club with the best four boats combined finishes. 2016 Foulweather Bluff Shirts are available for advanced prepaid purchase. The shirts will be short sleeved with custom designed graphics and boat names of boats registered by the earlybird deadline. Shirts are $20 IF PRE ORDERED. A very limited number of shirts will be available the day of the race for $25. Awards party afterwards at The Channel Marker (walking distance, 21+ bar, food available.) Leave your boat at guest moorage for free during the awards party. New this year - online registration! New this year - earlybird deadline of September 21! Earlybird registration is cheaper and guarantees your boat name on the shirt. To purchase more shirts separately from registration before the Wednesday before the race, use our online shirt store. A limited quantity of extra shirts will be for sale for $25 (cash, check or card) on Friday night and Saturday at the skipper's meeting and the awards party. Staying in guest moorage Friday night? See you when you get there! We'll be on hand to help you dock. Be ready to raft. The Port of Edmonds has overnight moorage available Friday and Saturday. Moorage rates are $1.40 per foot plus 4.50/night for electricity. Please indicate on your race entry form that you will be requiring moorage. Please sign in and pay your moorage when you arrive. Restaurants at the marina include Anthony’s Home Port, Anthony’s Beach Café, and Arnie's. As usual the Port of Edmonds is offering a half off sling and wash special. Social celebration at the Maplewood Rock & Gem Club. All are welcome.